Americas gateway to the universe. Leading the world in preparing and launching missions to Earth and beyond.Dec. 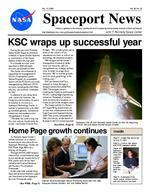 15, 2000 John F. Kennedy Space Center Spaceport Newshttp://www-pao.ksc.nasa.gov/kscpao/snews/snewstoc.htmVol. 39, No. 25(See 2000, Page 6)KSC wraps up successful yearHome Page growth continuesDuring the past year, Kennedy Space Center began an ambitious schedule of Space Shuttle launches as construction of the Space Station shifted into high gear. Five Shuttle missions were launched in 2000 and eight missions are planned for 2001. The Center also enhanced its capabilities for management of NASAs Expendable Launch Vehicle Program. Six expendable launch vehicle (ELV) missions were managed during 2000 and 13 ELV missions, including the 2001 Mars Odyssey, are currently scheduled for 2001. In addition to providing those safe, successful launches, the Center moved forward in its quest to enhance its mission as a Spaceport Technology Center. A number of partnerships with other government agencies, commercial enterprises and academia were strengthened or formed. The team has come a long way this year, and we should really be proud, said Center Director Roy Bridges. Weve had a great year in terms of the success of our operational missions as well as our technology development projects. We reorganized the Centers management structure to better focus our resources, and we strengthened our strategic partnerships to better leverage those resources. Weve laid the groundwork for more great things in the coming years. KSC positioned itself for a productive future through a reorganization effort called KSC 2000. The reorganization is enabling the Center to participate in NASAs cutting-edge engineering initiatives. Hundreds of workers were moved to new locations on Center as part of the reorganization. The Center and the Air Forces 45th Space Wing joined forces on several new enhancements to the Cape Canaveral Spaceport during 2000. They jointly celebrated the 50th Anniversary of the launch of Bumper 8, the first rocket launched (See WEB, Page 2) As Kennedy Space Centers culture continues its evolution toward a more innovation-driven Spaceport Technology Center, the KSC Home Page Web site is helping set the pace. Through the KSC 2000 reorganization effort, overall editorial, page layout and design responsibility of KSC public web site has been shifted to the External Relations and Business Development Directorate. At the same time, web development and technical Internet support was transferred to the Spaceport Services Directorate under Page 3  Control room opens and NASA managers named. Page 8  Employees of the month, poster contest winners and John Sexton  s new book. Pages 4-5 Spaceport News goes inside the Logistics Facility where 140,000plus types of spare parts are kept. InsidePage 2  Kodiak Star launch set for Aug. 21, 2001.Internet Services Manager Dennis Armstrong works with FDC web designers Andrea Sanders, left, and Debbie Barton. Endeavour lifts off from Kennedy Space Center on Nov. 30, beginning STS-97, the final Space Shuttle mission of 2000. SPACEPORT NEWS Dec. 15, 2000 Page 2 WEB ...(Continued from Page 1)Webmaster Patrick ORourke. Space Gateway Services (SGS) has assembled a team of web developers that, under the direction of KSC Internet Services, has assisted with the establishment of contemporary web design standards. SGS web developers redesigned more than 4,000 KSC public pages during the summer to give the site a more contemporary look and feel. A Home Page Coordinating Committee was established with members from each directorate and staff office. The group helps identify, redesign and update organizational pages currently linked from the public site. Spaceport Services is planning annual audits of all KSC-generated pages accessible by the public. But changes to the site go beyond a web design facelift and housekeeping  a number of new pages and features have been added and more are to come. In representing the space program, we want our Web site to convey how exciting and innovative the program is, said Dennis Armstrong, KSC Internet Services Manager. Because our site receives millions of hits each year  were over 200,000 million a year now  its an especially important avenue for educating and informing the public about what we do. Two of the newest offerings are mission-specific sites that are activated about three days prior to each Shuttle launch: The Live Countdown Coverage Page provides updated summaries of major processing events occurring during the final 10 to 11 hours prior to launch. See http:// www.pao.ksc.nasa.gov/kscpao/ shuttle/countdown/sts97/ milestonest.html The Shuttle Mission Quiz is an interactive game that challenges visitors to test their knowledge of the latest mission and win a prize. Answers to the questions can be found at various locations in the KSC Web site http:// pao.ksc.nasa.gov/ksctrivia/ index.cfm Earlier page additions include a series of pages defining the Spaceport Technology Center concept; a Shuttle Launch Simulation; a changing Blast From The Past feature recognizing KSCs historical contributions; and a virtual Guest Briefing that highlights the upcoming mission and crew. Several new pages are slated to come online in the coming weeks: a NASA timeline movie highlighting major events from the early days of the space program, current programs and future initiatives; and a Virtual Firing Room tour. Funding has been approved for the establishment of a web broadcast studio at the KSC Press Site by May 2001. This will allow for local Internet-specific programming of launches, landings and other events to include interviews with scientists and engineers and dignitaries of interest. The Spaceport Services Directorate has purchased and installed a new cluster of servers to which all External Affairs pages will be moved. These new servers will provide visitors with faster access to KSCs evolving Web site. To learn more about new KSC web policies and templates, see: KSC Web Design Policy. These pages lay out those NASA, KSC and other web design and administrative standards that are to be followed by any KSC organization desiring to develop a web page that will link to KSCs public web site. See http://pao-int.ksc.nasa.gov/ templates/standards/ policypage.htm Graphics and Template Design Main Page. A template page that presents requirements, resources, and examples to be used by NASA developers when preparing pages to be viewed by the general public via links to the KSC Home Page web site. See http://paoint.ksc.nasa.gov/templates/ template.htm For more information, contact Dennis Armstrong at 867-4493.Alaska Kodiak Star launch set for Aug. 31Above is a frame from a NASA timeline web movie that will highlight major events from the early days of the space program as well as future initiatives.Kodiak Star, the first planned orbital launch from the new Kodiak Launch Complex in Alaska will be a NASA collaborative mission with the Department of Defense (DoD). The KSC ELV program office will manage the launch. The payload consists of four small satellites to be launched aboard a Lockheed Martin Athena I launch vehicle. NASAs spacecraft in the Kodiak Star mission is Starshine 3. The satellite, about one meter in diameter and weighing about 200 pounds, is covered with frontsurface aluminum mirrors. They will be machined by technology students in Utah and polished by participating grade and high schools. PICOsat, the primary Department of Defense Satellite, is a technology demonstration satellite carrying four experiments. The second DoD spacecraft is a Prototype Communications Satellite (PCSat), operating in the amateur radio band. The third DoD spacecraft is SAPPHIRE, a micro-satellite .The primary mission of Sapphire is to space-qualify two sets of Tunneling Horizon Detector. The Kodiak Star is targeted for launch Aug. 31, 2001. Page 4SPACEPORT NEWSDec. 15, 2000 Inside the Logistics F a Keeping Kennedy Space Center and other Shuttle support centers supplied with parts for the orbiters and ground operations  from huge fuel cells to tiny nuts and bolts  is a massive undertaking. Its no wonder that the Logistics Facility, the building that houses administrative support and approximately 140,000 plus spare line items, measures in excess of 472,000 square feet. The facility was built in 1985 south of the Vehicle Assembly Building on Contractor Road to consolidate logistics functions near the processing area. The Logistics Facility includes warehouse space, storage platforms, chemical storage area, yard storage and office space. The value of supplies contained within the warehouse and storage areas at any one time is estimated at about $1 billion. While some supplies replenished and kept on hand within the facility are manufactured and periodically delivered by vendors, a number of the parts are about 20 years old, as old as the Shuttle program. A constant stream of parts and other materials are ordered, stored, processed and delivered to the customers. Parts must be inspected, sorted, periodically verified and sometimes repaired. An automated storage and retrieval system speeds processing requests. Damaged or worn items are also processed at the facility t to the vendor or the NA S Logistics Depot for repai r Orders for parts not on l from KSC, but also from o Shuttle support sites inc l Dryden Flight Research C Transatlantic Abort Site s Boeing Co. plant in Palm d where Columbia is being r bished. Customer service an d tion are essential in what said Eddy Walters, mana g Facility provides spare parts to KSC and o t A Logistics Fac i The Logistics Facility is filled with row after row of spare parts. One such row, in the rawstock and oversize items area, is p ictured above. At right is one of the bicycles that are used to transport some items within the facility. Page 5 SPACEPORT NEWS Dec. 15, 2000 a cility t hen sent S A Shuttle r l y come in o ther l uding C enter, the s and The d ale, Calif., r efurd satisfacwe do, g er of Storage and Distribution for United Space Alliance. Weve got about 6,000 to 7,000 different customers  thats anyone who might order something from us. About 500 KSC team members, primarily United Space Alliance employees, work in the facility. About 100 work in the warehouse area and about 400 in the facilitys office space. Employees work in a variety of departments including Processing Operations, Storage and Distribution, Transportation, Procurement, Logistics Engineering, Customer Support, Commodity Management and Quality Assurance. The major processes carried out in the facility include flight spares distribution, ground support equipment distribution, receiving, delivery, packaging and crating, kitting and repairable processing. So much happens here. Its like a world within a world, said John Kelly, manager, Vehicle Processing Storage Area. t her Shuttle support centers across world  Customer service and satisfaction are essential in what we do. Eddy Walters Manager of Storage and Distribution for United Space AllianceReceiving inspector Bob Rathjen checks a piece of convoluted tubing. Receiving inspector Fredia Ford answers a coworker  s question before checking packages received at the Logistics Facility. Woody Smith, manager of transportation and receiving, conducts one of his daily safety walkdowns of the receiving area at the Logistics Facility. i lity worker validates a stored item. Page 6SPACEPORT NEWS Dec. 15, 20002000 ...(Continued from Page 1)from the Cape. They also worked together to lay the groundwork for developing a comprehensive master plan for the Spaceport. Highlights of KSCs many accomplishments during 2000:Space ShuttleThe first Shuttle mission of the year, the Shuttle Radar Topography mission, STS-99, gathered billions of measurements of the Earths surface for government and public use. Three missions that followed  STS-101, STS-106 and STS-92  enabled astronauts to continue to build, outfit and prepare the International Space Station for its first set of long-term occupants, the Expedition 1 crew. The Expedition 1 trio took residence in November after being launched from Baikonur Cosmodrome, Kazakhstan. KSCs most recent launch, STS97 in late November, allowed astronauts to deliver and attach the P6 truss segment to the International Space Station. Two 108.6foot-long solar array wings were also delivered and activated, providing the Station with power for both habitation and Station science experiments. Orbiters launched by the KSC Team during 2000 carried 32 crew members into space, logged more than 23.4 million miles and carried many major payloads into orbit. Four of the five missions landed in KSC. Poor weather conditions at KSC forced the landing of Discovery at Vandenberg Air Force Base in California completing STS-92.Expendable Launch VehiclesAs lead center for NASAs acquisition and management of expendable vehicle launch services, KSC enjoyed a third successful year and moved headquarters into a refurbished E&O Building at the Cape Canaveral Air Force Station (CCAFS). For the first time, NASA KSC remotely managed a rocket launch. The High-Energy Transient Explorer 2 (HETE-2) launched from the Kwajalein Missile Range in the South Pacific in October. Because the Kwajalein site does not have a monitoring setup necessary for the level of management required by NASA, a system for remotely monitoring the launch was created at the Spaceport from Hangar AE. KSCs Expendable Launch Vehicle team supported two missions launched from CCAFS. Satellites launched were the GOESL weather satellite in May and the latest Tracking and Data Relay Satellite (TDRS-H) in June. From Vandenberg Air Force Base in California, the KSC expendable launch team supported the successful launch of the Imager for Magnetopause-to-Aurora Global Exploration (IMAGE) in March; the National Oceanic and Atmospheric Administrations NOAA-L spacecraft in September; and the Earth Observing (EO-1) satellite and SAC-C in November.International Space StationSeveral series of Multi-Element Integration Tests on Space Station components were held during the year to help avoid problems that would be costly to address in space. Vacuum chamber tests using a reactivated Apollo-era high altitude chamber were also held to ensure that Station elements, including the U.S. Laboratory, were airtight. Several Station components were officially transferred to NASA from The Boeing Co., including the Zenith 1 and P6 Integrated Truss Structures. In addition, a number of other Station components arrived at KSC for processing. Among major components delivered to KSC were the P1, P4 and S3 Integrated Truss Structures and the Joint Airlock Module.Spaceport Technology and Technology TransferKSC leadership continued to foster KSCs development as a Spaceport Technology Center. Specific technology areas targeted for emphasis were Fluid System Technologies; Spaceport Structures and Materials; Process Engineering; Command, Control, Monitoring and Range Technology; and Plant and Microbiological Sciences. KSC led the Agency in the number of technology licenses generated. Notable among new KSCdeveloped technologies: The Personal Cabin Pressure Altitude Monitor was offered for licensing. The monitor, which is about the size of a hand-held pager, is designed to warn individuals of potentially dangerous or deteriorating aircraft cabin pressure altitude conditions through audio, vibratory and visual alarms. In addition, a lighted digital screen displays a text message of the warning and the specific condition causing the alarm. The Medevac Oxygen System was shared with the Air Force through a technology transfer agreement with the KSC Technology Programs and Commercialization Office. The system was originally designed to provide therapeutic oxygen supply to astronauts being flown aboard the C-130 aircraft in case of a forced landing at a Space Shuttle Transatlantic Abort Landing site. It will be used by the U.S. Air Force Air Mobility Command in C-130 and C141 aircraft. A new nitrogen oxide scrubber for converting toxic vapors from the Shuttles hypergolic oxidizer into fertilizer was installed at Launch Pad 39A and the technology licensed to Phoenix Systems International, Inc. of McDonald, Ohio. KSC plans to install the system at all scrubbers, and CCAFS plans to install the system at the Titan Launch Complex 40. Phoenix Systems anticipates applying the technology to at least 40 percent of the countrys coal-, oil-, and gas-A newly arrived external tank is transported to the Vehicle Assembly Building (VAB). The tank was moved to one of the VAB  s high bays to await stacking for a future Shuttle mission. Dec. 15, 2000SPACEPORT NEWS Page 7fired boilers.Contracts, Agreements and FacilitiesNASA selected Boeing Delta Launch Services Inc. and Lockheed Martin Commercial Launch Services Inc. for the NASA Launch Services contract awards. An Indefinite Delivery/Indefinite Quantity contract was awarded to each contractor with a minimum of one launch service over 10 years. NASA is authorized to order a total of 70 launch services under all the contracts bringing the total estimated value to $5 billion. KSC and the 45th Space Wing marked their second full year under its Joint Base Operations and Support Contract (J-BOSC). Through J-BOSC, a single set of base operations and support service requirements have been established for KSC, CCAFS and Patrick Air Force Base (PAFB). Eighteen different contractors, often with overlapping and duplicate responsibilities, previously performed these services. The two organizations further strengthened their partnership by signing an interagency agreement that established the Joint Planning and Customer Service (JPCS) office. The agreement brings together an integrated staff into a single office to represent both agencies at the Spaceport. The JPCS serves as a one-stop shop for new customers of the two federal agencies. The two organizations also signed the Consolidated Comprehensive Emergency Management Plan (CCEMP). The CCEMP established uniform policy guidelines for the effective mitigation of, preparation for, response to and recovery from a variety of emergency situations at the Spaceport. Emergency Preparedness at the Spaceport was further enhanced by the acquisition of the Mobile Command Center (MCC), a specially equipped emergency response vehicle. The MCC allows the emergency response team to better respond when emergencies at the Cape Canaveral Spaceport require a mobile field command center. The vehicle was purchased by the J-BOSC contractor Space Gateway Support through J-BOSC contract savings. The State of Florida appropriated $14 million to help fund construction of the Space Experiment Research and Processing Laboratory (SERPL), a magnet facility for KSCs planned Space Station Commerce Park. The SERPL, being designed by NASA, will support life sciences and biological flight experiment processing and research for the Space Station. The Cryogenics Testbed Facility was unveiled in April. The facility provides a resource for collaborative research and development in the areas of thermal insulation systems, cryogenic components, propellant process systems and low-temperature applications. The new Vapor Containment Facility, adjacent to the Space Station Processing Facility, opened in July. Ammonia servicing equipment used to perform preflight tests and service of ISS hardware is now housed in the facility. The Vehicle Assembly Buildings Safe Haven modifications were tested in August. For the first time in Space Shuttle history, a fully stacked Shuttle rolled into High Bay 2 of the VAB. Modifications to the VAB and nearby rock-paved crawlerway were completed, allowing more storage space and protection for Shuttle flight hardware from hurricanes or tropical storms. The new Checkout and Launch Control System (CLCS) at the Hypergolic Maintenance Facility was declared operational in September. It was the first of several new CLCS rooms scheduled to come on line in the coming months. CLSC is a multi-year project designed to replace outdated control rooms at KSC with highly sophisticated computer systems and software. A new high-pressure helium pipeline to service launch needs at the new Delta IV launch complex, Complex 37 at CCAFS, was commissioned in November. The nine-mile-long, buried pipeline for Complex 37 will save NASA money through sharing use and costs of the KSC Helium Facility. It will also serve as a backup helium resource for Shuttle launches. Also in November, a ribbon cutting was held for the refurbished E&O Building. Home for NASAs unmanned missions since 1964, the building was renovated to host the Expendable Launch Vehicle Program at KSC.Tourist Destination UpgradesSeveral new exhibits, an Astronaut Encounter show and the Dr. Kurt Debus Conference Facility opened at KSC Visitor Center. The major new additions represented the final phase of a $120 million redevelopment project by Delaware North Parks Services of Spaceport Inc. The new conference facility features an Early Space Exploration exhibit, which highlights early missions. A second new exhibit, Exploration in the New Millenium, showcases explorations to Mars. To ensure funding for significant future upgrades to the Visitor Center, a new admissions policy went into effect. An all-inclusive admission ticket now provides access to the KSC bus tour, IMAX films and the Robot Scouts and Universe Theater attractions.Community Outreach and EducationKSCs contributions through the 2000 Combined Federal Campaign exceeded its goal of $220,000, with more than $260,000 given by KSC Civil Service employees. In addition, 1,174 KSC, CCAFS and PAFB employees joined the National Marrow Donor Program at KSCs third annual registration drive. KSC and CCAFS jointly hosted a Community Appreciation Day on Nov. 4. More than 43,000 Brevard County residents in addition to thousands of KSC and CCAFS employees attended. KSC hosted the first Florida Space Summit in January. The summit looked at the future of space as it relates to the state of Florida. Then in August, KSC hosted the annual Community Leaders Briefing. KSC executives met with various community leaders from across Brevard County and the State of Florida about long-term viability of KSC and benefits the space program contributes to the community. On the education front, the NASA KSC Property Disposal Office coordinated the donation of 1,501 computers to students during Fiscal Year 2000, which ended Sept. 30. Major donations were made to schools in Pike County, Ala., and Memphis, Tenn. Students from all over the country gathered for the FIRST (For Inspiration and Recognition of Science and Technology) regional competition at the KSC Visitor Complex in March. Thirty teams of high school students tested the limits of their imagination using robots they designed to compete in a technological battle against other schools robots. To educate employees and help facilitate the changing Spaceport culture, 7 Habits personal mastery training of all civil service employees was completed. Through these efforts and others, KSC began the new millennium with a reinvigorated sense of destiny and a clear plan for continuing excellence in launch operations and technology development.Endeavour lands at Kennedy Space Center, ending STS-97. Four of the past five Shuttle missions this year ended with a landing at KSC. John F. Kennedy Space Center Managing editor. . . . . . . . . . . . . . . . . Bruce Buckingham Editor. . . . . . . . . . . . . . . . . . . . . . . . . . Kathy Hagood Editorial support provided by InDyne Inc. Writers Group. NASA at KSC is located on the Internet at http://www.ksc.nasa.govUSGPO: 533-128/00047Spaceport News Spaceport News is an official publication of the Kennedy Space Center and is published on alternate Fridays by the Public Affairs Office in the interest of KSC civil service and contractor employees. Contributions are welcome and should be submitted two weeks before publication to the Media Services Branch, XAE-1. E-mail submissions can be sent to Katharine.Hagood-1@ksc.nasa.gov Page 8SPACEPORT NEWS Dec. 15, 2000 Photographer John Sexton  s new calendar,  Space Shuttle An Inside Look,  and book,  Places of Power,  are available through the NASA Exchange store. For more information on the book or calendar, see www. VentanaEditions.com.Employees of the Month Contest winnersAs part of America Recycles Day, the NASA Environmental Program Office coordinated a Center-wide poster contest that was sponsored by the Office of the Federal Environmental Executive. A Certificate of Appreciation was awarded to the four entries submitted by NASA, all of which were submitted from KSC. Posters were designed and submitted by the following children: Afton Shelton,11, pictured right, Mathew Houser, 8, and Ryan Mulcahy, 14, pictured left. ARD 2000 Calendars, highlighting the winning posters, are expected to be released by the end of January 2001. To view the posters, see http:// environmental.ksc.nasa.gov/recycle/ intro.html December employees of the month are, from left, Robert Summers of the Shuttle Processing Directorate, Kathleen Mease of the ELV and Payload Carriers Program, Penny Chambers of the Chief Counsel  s Office and Klaus Staefe of the Spaceport Services Directorate. Employees of the month not shown are Roslyn McKinney of the Equal Opportunity Office, Carol Aiello of the Joint Performance Management Office and Walter Feitshans of the Spaceport Engineering and Technology Directorate.Evidence of past water on MarsIn what ultimately may be their most significant discovery yet, Mars scientists say high-resolution pictures showing layers of sedimentary rock paint a portrait of ancient Mars that long ago may have featured numerous lakes and shallow seas. "We see distinct, thick layers of rock within craters and other depressions for which a number of lines of evidence indicate that they may have formed in lakes or shallow seas. We have never before had this type of irrefutable evidence that sedimentary rocks are widespread on Mars," said Dr. Michael Malin. He was the principal investigator for the Mars Orbiter Camera on the Mars Global Surveyor spacecraft at Malin Space Science Systems, San Diego, Calif. Such layered rock structures where there were once lakes are common on Earth. The pancake-like layers of sediment compressed and cemented to form a rock record of the planet's history. The regions of sedimentary layers on Mars are spread out and scattered around the planet.